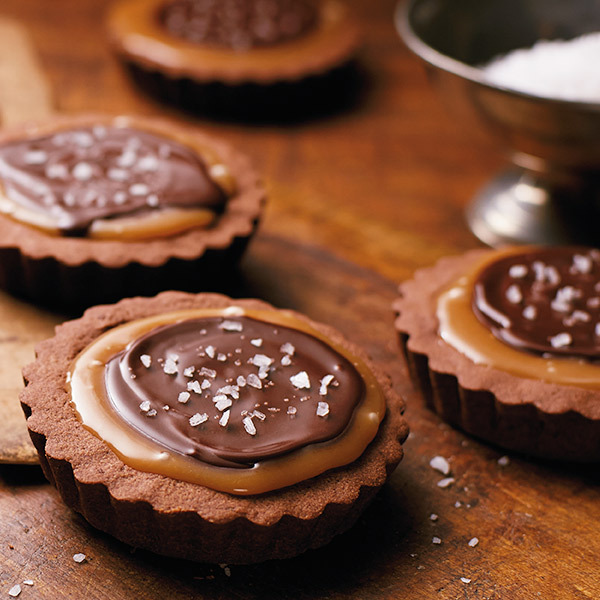 Easily dress up regular brownies by using a mini tartlet pan or a mini-muffin pan to create these lovely Salted Caramel Brownies. A time-saving, prepared brownie mix creates the base. Caramel candies and heavy cream make up the next layer followed by chocolaty ganache. A sprinkle of sea salt on top adds depth and surprise to these delicious caramel brownies. Preheat oven to 350°F. Grease cups of mini tartlet pan or mini-muffin pan, or line with muffin liners. Pour 2 tablespoons brownie batter into each cup. Bake for 10 minutes or until center is just slightly firm. Melt the caramel candies and heavy cream together in microwave, stirring every 30 seconds until smooth and melted. Pour a layer—about 1 tablespoon—of caramel over each brownie. Place the chocolate chips and heavy cream in small saucepan on very low heat on stove. Stir constantly until chips melt and glaze is smooth. Remove from heat. Pour ½ tablespoon in the center of each caramel layer. Lightly sprinkle each brownie with sea salt.